"People have choices, animals don't." Feb. 2012 - THIS IS WHAT LOVE CAN DO! 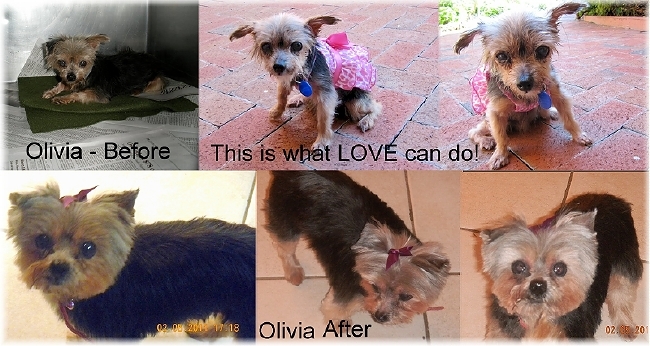 Olivia was dumped at a high kill shelter 14 months ago. She was old, thin, frail, blind and frightened. We agreed to take her in, figuring she could quite possibly spend the rest of her life with us. But then a wondeful couple stepped up. They adopted her. They paid for her to have cataract surgery in BOTH eyes. They nursed her back to health. Most of all, they LOVED HER. She is now an amazing little girl, with perfect vision, a full coat of hair and a happy disposition. When I got these pictures (below) today I almost cried! The first photo is of her before we got her into our rescue, the second two were when she first arrived wearing her pink dress... and the bottom three photos of her today! The yorkies in the two videos above were rescued from a Puppy Mill breeder. Many of them spent their entire lives in cages and never experienced the feeling of grass under their feet or sunshine in their face. They were all sadly neglected and in bad shape when they arrived. They have all since been adopted and are living wonderful healthy lives now. Dasher was a puppy that was rescued from a Puppy Mill. When he arrived he didn't know what a toy was, didn't know how to play, how to bark... it was as though he didn't even know he had a voice. During his time in foster care he learned how to play with toys, with other yorkies and he learned how to bark. Oh, how he learned how to bark!!! Dasher discovers his voice for the first time!!! Video above is of Jake being adopted. He was so happy which is pretty darned obvious. He didn't even miss me when I left. Video above is a game we love to play called Food Grab. Holly has become an expert at it. She has long legs! Video above is the story of Teddy B. The facts in the above video are alarming. The wonderful vets at All Creatures Animal Hospital in Stuart, FL successfully removed Max's eye (above). He recovered nicely and is feeling much better! HE HAS NOW BEEN ADOPTED! Thanks to all who inquired abaout this special little boy!!!! Video above is of our Kissing Yorkies. Yorkie puppies learning being weaned. Puppies play with their Mom. 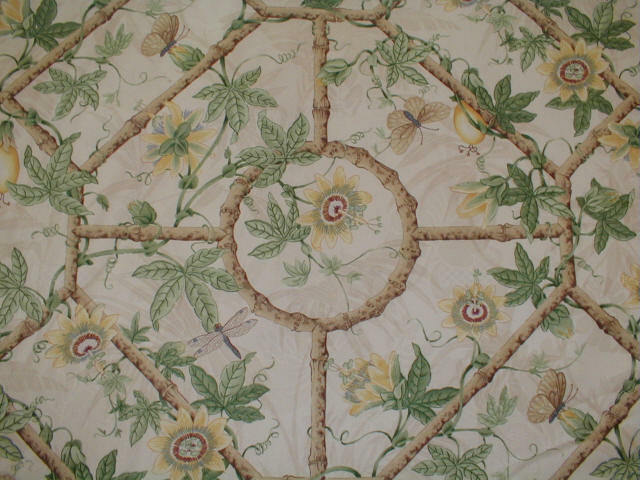 A limited time offer.... ten of these soft art pieces will be made by the artist. Hurry and order yours today. Video above is the story of Einstein. the dog that wouldn't run away. Tulip - a tiny young yorkie dumped and left to die. Check the medication your dog is given at all times. Mistakes are made every day! 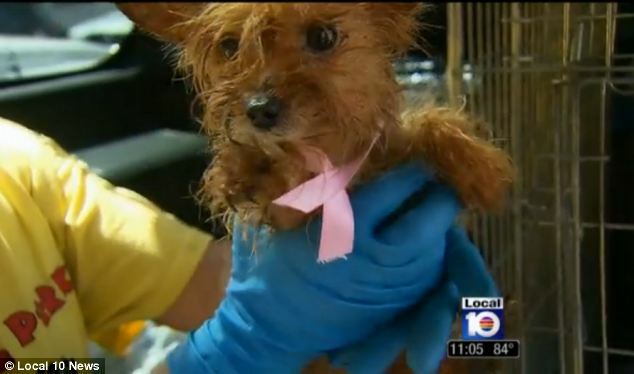 Florida Yorkie Rescue took in six of these dogs. Click here for their video story since arriving. They have ALL been adopted and found wonderful new owners! CLICK HERE TO SEE A VIDEO OF THE HOUSE OF HORRORS THESE POOR BABIES CAME FROM. We now have way too many Videos to post here on our website. Please go to www.youtube.com and do a search under Florida Yorkie Rescue to see ALL of the many heartwarming stories of our yorkie rescues. F.Y.R. participated in the Delray Beach Holiday Parade this year with G girl Productions held on 12/12/15 and filmed by VIP TV. A great time was had by all and the dogs we had on the float; dressed up in their finest was a bit hit with the crowd. This above video shows just a snippet of the many yorkies and other small breed dogs we have taken in, some of their special stories and the many families who adopted our precious babies. F.Y.R. threw a Birthday Party for Natasha on January 31st. Natasha was accepted into our SOS Program (Save our Seniors) when she found herself homeless at the age of 16! After some much needed medical care she is thriving and just turned 17! F.Y.R. threw a Volunteer Appreciation Luncheon for our Foster Moms and Transport Angels on Sunday, March 6 that was held at Carmine's restraunt in Jupiter, Florida. A great times was had by all and most everyone brought their yorkies... Oh my... we had a yorkie explosion! FYR was invited to their Yorkie Social by "Pucci and Catana" located at Harborside in Jupiter, Fl. We brought along with us seven of our adoptable yorkies. Our yorkies were a big hit with the public. A portion of the store sales was donated to Florida Yorkie Rescue.